Reach your frontline teams instantly with an app they’ll love! Increase productivity with every message, using powerful analytics. Simple to set up and free to try. Ready to learn how Blink is more than an intranet? Blink has transformed our Internal Communication. We reach everyone with a consistent message and employee feedback has been amazing! Your frontline workers are experts on your customers and your products. Give them the information and tools they need to be successful. No corporate email address? No problem. Your drivers, engineers, trainers and everyone else can access important updates, check route information and complete reports. Always on the move? Staff can acknowledge urgent notices, access documents and share images from their mobile phone. Need everyone on the same page? A branded employee experience fuels a passionate and consistent customer experience. 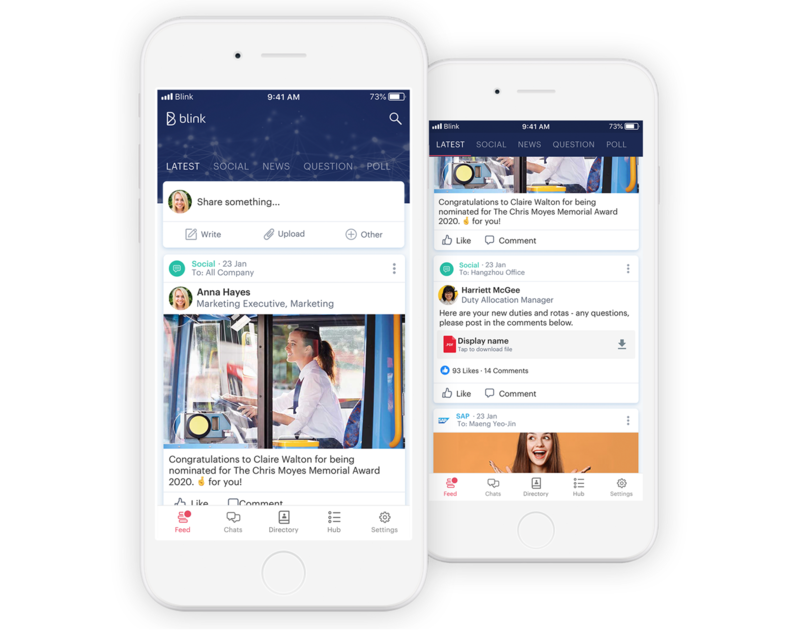 More than an employee intranet, Blink is the app built to deliver employee engagement for today's dynamic, modern workforce. You’ll see 5x higher engagement with your content and 3x the reach with Blink vs a mobile intranet. 81% of Blink users open the app every single day. You can get started now and Blink is free for up to 20 people, with apps for mobile, desktop and web. At the core of your new employee app is a Feed, a Hub, a Directory and Chat. The Feed is so much better than a traditional intranet. It’s where colleagues share updates, photos, videos, polls, documents, links, priority alerts and much more. The Hub is for your key content, documents, policies, brochures and guides. The Directory and Chat round off the app, so that everything is in one place. The Feed is not just about company news. Any applications that you sync can post interactive cards into the feed. It’s everything you need for internal communication when and where you want it. Finally - one place for everything. One app to open each morning – or whenever you need it. Blink connects to cloud storage like OneDrive, GDrive and Dropbox. It has in-built integrations with JIRA, ServiceNow, Salesforce and more. Our partnership with Zapier means Blink works with thousands of additional apps and developers can use our open API to connect almost anything else. Put every action from every app into Blink's smart feed. We integrate with these and many more apps. Quickly access your files, calendars emails and more wherever you are. Manage contacts, track opportunities, and close deals faster. Automatically moves info between Blink and the other apps you use during your day. Jira helps every team reach their full potential with powerful workflow and project tracking. Manage your team's help desk ticketing, issue tracking, and customer service support. Data from your Blink and SAP systems stays in sync without manual intervention. Approve changes and manage incidents. Surface calendar entries, emails, and files on Google Drive. HR tasks right at your fingertips, update your details and check payslips. Measure post reach, impressions and engagement (comments and likes) in realtime. So you can see which content is working. Choose to send out a push notification, disable comments, schedule a post for the future and even schedule an expiration date. Blink includes all the tools you need to manage your internal communications strategy! When you need to share information, often the first challenge is to find it -- even when you already have an employee intranet in place. With Blink a single search finds records in ServiceNow, Salesforce and JIRA as well as files in OneDrive, GDrive and Dropbox. Give your people access to the right data, at the right time, and enable secure file sharing from mobile devices, tablets or PCs. Blink integrates seamlessly with your existing O365, Sharepoint and Google Suite platforms. Blink can sit alongside your current intranet, or replace it as your employee communication app. We combine calendars, automatically provision users and enable single sign-on. Enterprise IT never worked this well before. Blink isn’t just for mobile workers. Blink includes a browser based portal and native desktop apps for Windows and Mac. Your users can sign-up using a mobile phone number or email address. We even make rollout super simple - choose between SMS invites (with a special magic link), email invites or print out individual codes. For office staff, our Windows desktop app supports Transparent Authentication; so your users don’t even need to log-in! Now that’s clever. How is an employee app different to a mobile intranet? The average Blink user opens the app 6 times per day. 81% open the app every day. This is because we're not a mobile website, or a website turned into an app. Blink is designed to be significantly simpler, more intuitive and easier to use than existing solutions. And yet, more powerful. If you’re looking for an Internal Comms app, Intranet app, Employee Engagement app or mobile Intranet, Blink can help. You can have the best content in the world, but if you’re not delivering it in the way people want, they won’t engage. Replace your legacy intranet with a modern employee app and portal today.